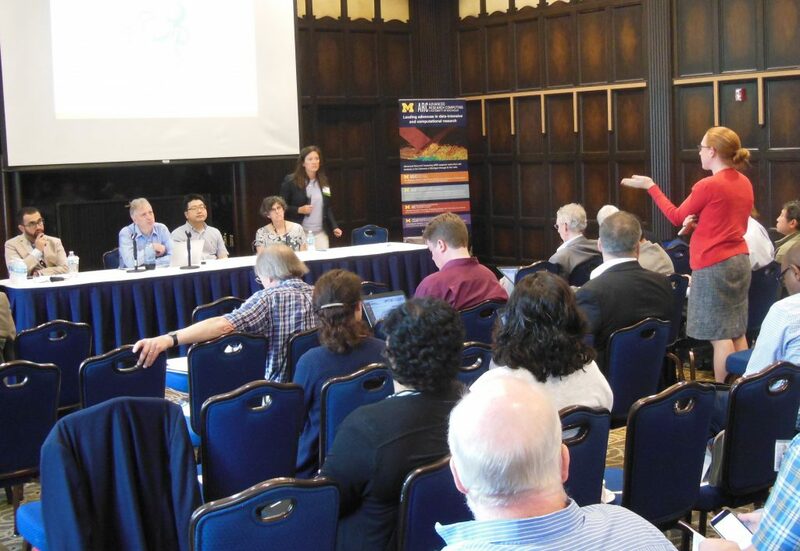 The Big Data in Transportation and Mobility symposium held June 22-23, 2017, in Ann Arbor, MI brought together more than 150 data science practitioners from academia, industry and government to explore emerging issues in this expanding field. Sponsored by the NSF-supported Midwest Big Data Hub (MBDH) and the Michigan Institute for Data Science (MIDAS), the symposium featured lightning talks from transportation research programs around the Midwest; tutorials and breakout sessions on specific issues and methods; a poster session; and a keynote address from two representatives of the Smart Columbus project: Chris Stewart, Ohio State University Associate Professor of Computer Science and Engineering, and Shoreh Elhami, GIS Manager for the city of Columbus. Speakers and attendees came from a number of organizations from across the midwest including the University of Michigan, University of Illinois, University of Nebraska, University of North Dakota, North Dakota State University, Ohio State University, Purdue University, Denso International America, Fiat Chrysler, Ford Motor Company, General Motors, IAV Automotive Engineering and Yottabyte. At the closing session, participants outlined some areas that could be fruitful to focus on going forward, including increasing data-science literacy in the general public; diversity and workforce development in data science; public data-sharing platforms and partners; and privacy issues. For a complete list of speakers and topics, please see the agenda. Videos of selected talks will be posted at midas.umich.edu in the coming days. Talks from the 2017 MICDE Annual Symposium are now available on the Advanced Research Computing YouTube channel. Due to technical difficulties, the afternoon sessions (Emanuel Gull and J. Tinsley Oden) were not recorded. 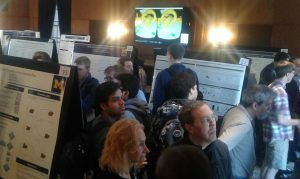 Fifty-six posters were submitted to the 2017 MICDE symposium poster competition. Last week’s MICDE annual symposium included a poster competition for students and postdocs. The event featured 56 posters that highlighted the interdisciplinary nature of the institute. (Some of the posters were described in a story in the Michigan Daily). All of the titles and abstracts submitted are in this spreadsheet. Victor Wu, Ph.D. Candidate in the department of Industrial and Operations Engineering, won first place and $500 for his poster “Multicriteria Optimization for Brachytherapy Treatment Planning.” Wu and co-authors Epelman, Sir, Pasupathy, Herman and Duefel, introduced an efficient Pareto-style planning approach and intuitive graphical user interface that enables a planner or physician to directly explore dose-volume histogram metric trade-offs for brachyotherapy treatment – a common method for treating cancer patients with radiation. Sambit Das, Ph. D. Candidate of Mechanical Engineering, earned second place and a $250 prize for his work on “Large Scale Electronic Structure Studies on the Energetics of Dislocations in Al-Mg Materials System and Its Connection to Mesoscale Models“. Third place, also with a $250 prize, went to Joseph Cicchese, Ph. D. Candidate in the Department of Chemical Engineering, for his poster titled “How to optimize tuberculosis antibiotic treatments using a computational granuloma model“. Cicchese and co-authors Pienaar, Kirschner and Linderman, proposed a method of combining an agent-based and multi-scale model of tuberculosis granuloma formation and treatment with surrogate-assisted optimization to identify optimal tuberculosis treatments.